December 26, 2004 was a day like any other. In Thailand, it was peaceful, warm … a nice day for a family vacation. And then, just like that, it all changed. As you may recall, this was the day that a giant tsunami hit southeast Asia, devastating Thailand and leaving death and destruction in its wake. Among the people who got swept up by the wave were the Belon family, who were on holiday. 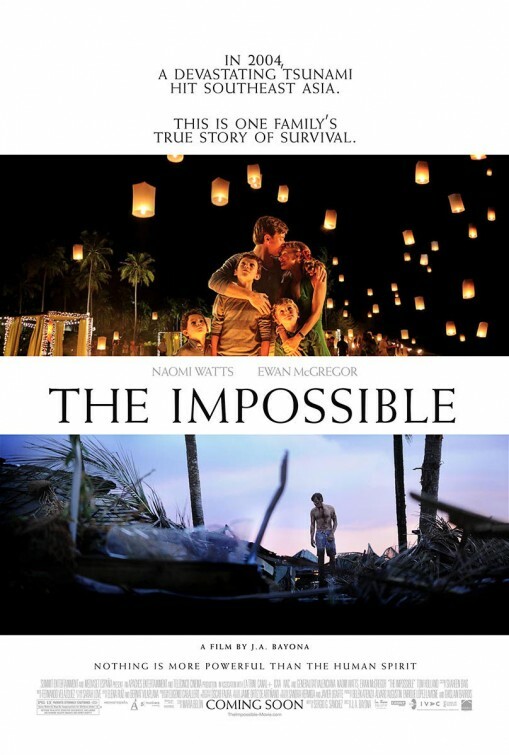 It’s their story that inspired the new movie, The Impossible. For inexplicable — and, some would say, inexcuseable — reasons, in the film, the Belons, a Spanish family, have been turned into a British one. Maria and Enrique Belon have been changed to Maria and Henry Belon, and they’re played by Naomi Watts and Ewan McGregor. This questionable decision has greater implications for the movie, but let’s put that topic aside for a minute, okay? The Impossible documents just how suddenly the wave hit. All is quiet. And then, without warning, the wind picks up, birds start to flee, the ground rumbles, people look up, and BAM! Director J.A. Bayona captures nature’s fury in all its horrific glory, and we watch as Watts and Tom Holland (playing her son, Lucas) are dragged along by the force of the tide, grabbing on to trees and limbs when they can, getting scratched by sharp surfaces and objects, and holding on to each other for dear life. The rest of the family could be dead for all they know. Sound that disorients the viewer and mirrors the sensation of being underwater, and camerawork that puts you right there with Maria and Lucas, make this scene perhaps the scariest thing you’ll see on screen for a very long time. Elsewhere on the island, Henry is faring better, though he aches at not knowing where the rest of his family is. The two stories happen in parallel, and whether the action is centered on the hospital, as Maria is tended to by non-English-speaking doctors, or on Henry as he struggles to stay strong, it’s not easy to watch. Parts of it are downright stomach-turning. Bayona puts us right in the middle of the chaos of those first days after the wave hit, with frantic survivors trying to take care of each other and find their missing relatives at the same time they’re dealing with their own health. And through it all, Watts and Holland’s impressive performances capture the fear and survivalism on display, as they help each other and those around them. It’s almost a defense mechanism, so they don’t think about how tenuous their own situations are. It shouldn’t be a spoiler to tell you that, miraculously, the family is reunited at the end. After all, why would they make the movie if it didn’t have a happy ending? And sure, the ending is “enhanced” by the swells of music that make the scene more dramatic and emotional in a manipulative way. But this triumph against the odds story is a more powerful — and spiritual — example of hope winning out over despair than Life of Pi was, if only because unlike that other movie, what happens in The Impossible actually happened. It’s real. Except for that sticking point about the whitewashing, that is. To believe Bayona’s film and take it at face value is to think that only the white people made it out alive. There were thousands of people affected by the tsunami, and with the exception of a scene in which Maria and Lucas are assisted by some kind Thai folks who put the tourists’ needs ahead of their own, the only people’s stories we follow are white. It’s as if the locals got through the tsunami completely unscathed. And this all would be easier to ignore or overlook were it not for the fact that Bayona made the decision to show a photo of the real Belon family at the end of the film. It’s a slap in the face that makes everything we’ve just seen ring false. The Impossible is a universal story of survival that should have transcended race and ethnicity. Which is why, despite Watts and Holland’s noteworthy performances, and the skillful, powerful recreation of the tsunami, I’m going to drop the film a grade and only give it a B. 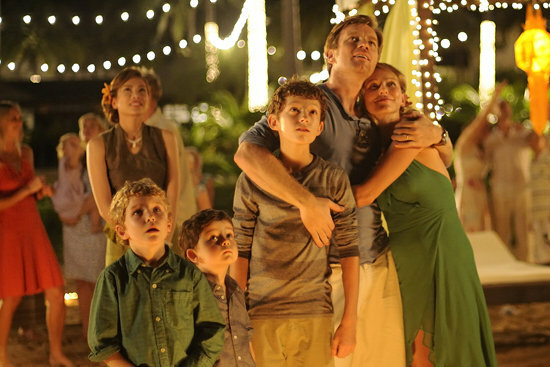 Have you seen The Impossible, or is it on your must-see list? Share your thoughts in the comments section below. I saw The Impossible three days ago. Had no thought, as far as, the family being white, but couldn’t understand why their country of origin was never mentioned and have spent time on the Internet since then to solve the mystery. Maria and Enrique Belon are Spanish. Maria was highly involved with the making of The Impossible. She chose Naomi Watts to portray her, because Watts was her favorite actress. This is why the family in the film is British. Maria Belon insures that the movie is completely accurate except for this one change. She has also been adamant in regards to her story of survival not being the only one and insisted that The Impossible would convey this as well.